ZOEfan.net: ZOEfans: Meet Laura Scott! ZOEfan: Hi, Laura. Thanks for agreeing to be interviewed. Please tell our readers a bit about yourself. Laura (Red): Hello, my name is Laura Scott but most people know me as Red. I’m from Milwaukee, WI but transplanted to Rapid City SD for grad school and now life. I was married to David “Az” Scott in 2010 with a wonderfully nerdy wedding and are now raising our own little geek Matthew, 18 months. I am a Paleontologist by trade but work for the municipal government now. In my free time (ha) I make dice-jewelry and costumes. I am currently a 10-time award winning costumer with costumes from Final Fantasy 14 to the web series “The Guild” to Star Wars. I’m not going to bore you with the list of fandoms I love so we will just say there isn’t much I don’t like. ZOEfan: What are your top five favorite shows (series, short and/or feature movie)? Red: I grew up on Star Wars. I really became a fan after the reboot in 1997. My son loves Star Trek so we watch a lot of that while he is up. I’m getting my husband to watch Buffy for the first time. I love Marvel; Agents of Shield, Agent Carter, Captain America all of it. And while the tv show was okay, the books are so much better for the Dresden Files. ZOEfan: What made you a fan of the ZOE community? Red: After being introduced to The Gamers and The Gamers: Dorkness Rising, I just fell in love with the story and the voice behind it. As I dug deeper, I learned about the web series JourneyQuest and just devoured that. The stories were relatable, the characters were down to earth but funny. They were things I as a gamer had experience at that table with my gaming group. ZOEfan: Of all the shows on ZombieOrpheus.com, which has been your favorite? Red: My favorite show to share with people who are not gamers is actually Transolar Galactica. The shows are short and can stand alone, making them great to drag a non-gamer into something fun. My favorite to share with gamers is always to start at the beginning with “Gamers.” It’s great for dragging them into the next two movies and then into Natural One as an add on. But my favorite production from ZOE is The Gamers: Hands of Fate. I had a very interesting email exchange with Matt Vancil before that went into production and I am so pleased with the outcome, though I’m not sure if he remembers it. It is a story that means a lot to me as a female gamer and being part of it showed me how amazing and welcoming the production crew and the fans of ZOE really are. ZOEfan: Are you a backer? If so, what are some projects in the ZOE community that you’ve supported and why? Red: We have backed a number of projects now. JourneyQuest season 2, Gamers Hands of Fate, Gamers: Pwned and others I can’t remember. The model for ZOE has always been Fan Supported, Creator Distributed and I love how that works. We the fans love the shows/movies/projects; we get the creator funds to make that happen. No middle man, no other hands pulling money. I know who is getting the money and I know what they are doing with it. I like that feeling of knowing I’m making these shows happen. I’m part of that. ZOEfan: What has been your favorite backer reward? Red: We are a little bit crazy in that when the next kickstarter for a film project happens I generally know what we are pledging. For both JourneyQuest and Hands of Fate, my crazy husband and I have backed to the level of on screen speaking roles and we will do it again. David was Horkorian in JourneyQuest and I was the Unseelie Tuatha from Hands of Fate. When we went to Seattle for JQ2, we were in pre-production for our own web series, Bar Flies. So we sat down with Beau Prichard and I asked him every question I could think of for a series starting out. He was so kind sharing everything he had learned with us and it made a huge difference as we went into production. Our second trip to Seattle was like coming home. We were able to be part of filming for 3 days with Hands of Fate. We arrived on set late after hearing a need for more extras and we were amazed when things seemed to stop when we walked in so we could be hugged by various members of the cast and crew. 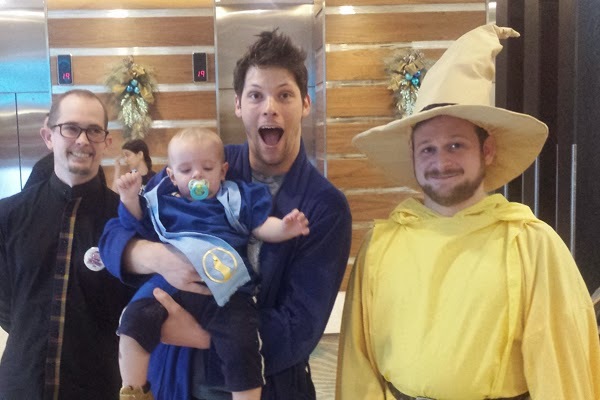 It was an amazing welcome for the two random gamers from South Dakota. So you will probably see us in the next film project they shoot in Seattle. ZOEfan: What kinds of fancrafting have you done and where can readers find them? Red: I haven’t done much fancrafting of ZOE material mainly because my artistic skills fall more to the 3d arts. 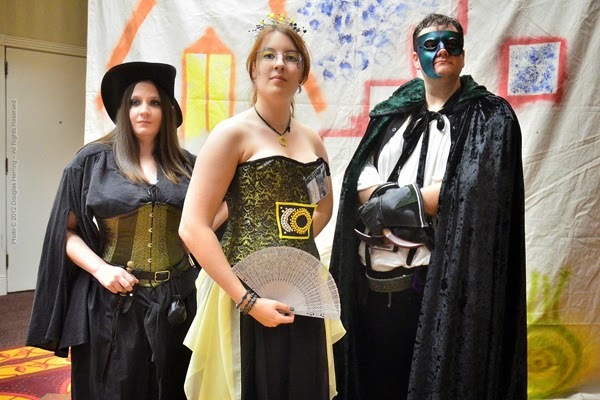 I made both my husband and my costume for Hands of Fate and when we attended ZOECon2014 I made a Carrow costume for my son and Perf costume for my husband. I had a crazy idea that as a retromancer Perf attempted to bring Carrow back to life by casting undead. However, the spell cast as rebirth hence the now infantile state of Carrow. My son however would not let daddy wear the Perf hat. Aside from costumes, I do make and sell dice jewelry and other geeky crafts like nerdy cross stitches and bags. ZOEfan: What piece of your own work are you most proud of? Red: I think my proudest moment in relation to the things I’ve created would have to be at Dragoncon. 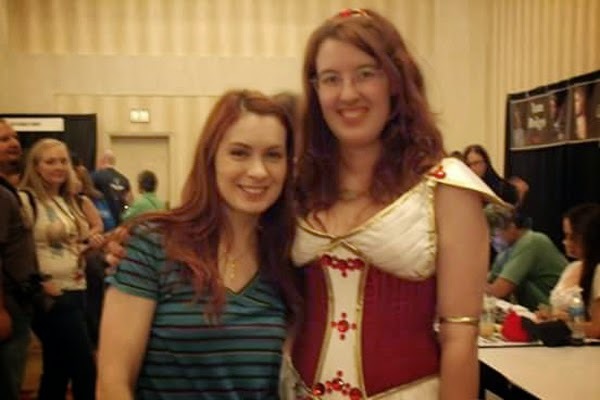 I was wearing my Codex costume while meeting Felicia Day and as I walked up she crawled under the table. Popping up next to me she declared “you are the taller version of what I want to be!” I just about cried. That costume won three different awards between 2 conventions. 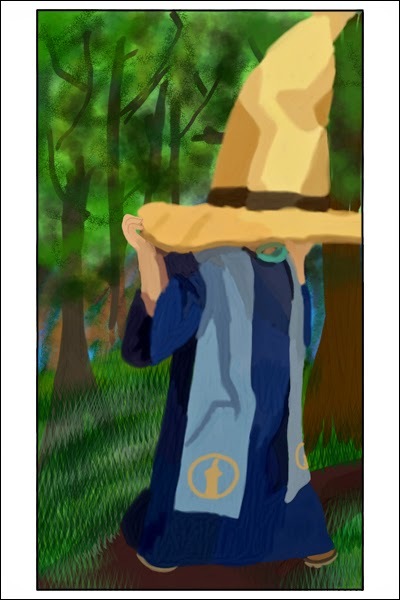 I also painted a picture of my son in his Carrow costume wearing our Perf hat. I still think it’s cute that you can see the pacifier under the hat. ZOEfan: Have you had a chance to interact with any of the cast and crew? If so, what has been your favorite, or most interesting interaction? Red: This is a really hard question. When shooting JQ2 we got invited out for ice cream and pin ball after the filming was done. After Hands of Fate got full funding, there were the response tweets from crew members. At ZOECon1, we got to help out by housing Nathan Rice, Conner Marx and Casey Smith by the end of Sunday. Conner sat and listened to an interview done by my husband and myself while holding kindly my stuffed t-rex. The t-rex happens to be the mascot of our production company, Red T-Rex Productions. There was randomly singing the Hymn of Therin to the goddess herself in a back hallway at ZOECon1 (thanks Nathan for the help with lyrics). There was the kick line with Matt, Ben, Tony and myself after the LARP scene wrapped from Hands of Fate. There was all of ZOECon2014. 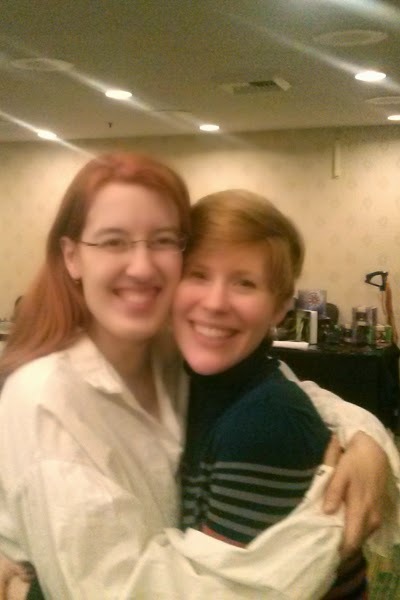 But I think after all that my favorite interaction was getting to the hotel for ZOECon2014 and walking up to a group of fans and stars and getting hugs and smiles from all of them in greeting because they were happy we were there. I have never felt so warmly welcome as I did upon arriving to that convention 1200 miles away. ZOEfan: What upcoming ZOE or related project are you most excited about? Red: I heard Aiden 5 is heading to a second season YEAH!! Also I’ve been trying to keep up with Gamer Chick. I am waiting with a crazed fan boy for more JourneyQuest. I had to miss out on the table reading at ZOECon2014 because baby wasn’t in the mood to sit and listen. But after the end of Hands of Fate I’m trying to figure out how to just funnel all the money to ZOE to get more of that produced. ZOEfan: What’s one interesting question I didn’t ask here, and what would be your answer? Red: Which Zoe character do you identify with most? I actually identify with Carrow from Journeyquest. Trying so hard to hold on to what is true and what you believe when so many outside forces are getting in your way and telling you that you can’t. Wanting to help but knowing that you can’t and if you do you will probably just do more damage. Knowing that all you can be in there. Carrow has is rough and I know I’ve got it pretty easy but I can commiserate with where he is at the end of season 2. There are so many battles being wages around gaming and women in gaming and there is so little I feel I can do. It’s frustrating. I feel like I should do more but I don’t know what or how to help. It’s nice to see the projects in Zoe supporting equal rights to gaming for men and women. Discrimination and intolerance are not welcome here and I thank everyone for supporting that. ZOEfan: Where can readers go to learn more about you and/or your creations? Red: I have a little side business called Red’s Shiny Bits. That is where I create and sell all my little geeky items. I am slowly selling at more conventions so you never know when I’ll pop up but I can take custom orders on Facebook or you can just check out what I’ve played with recently. I also have an Etsy but it’s empty right now as I’m trying to find time to make stock and get things loaded and be a mom and have a full time job. So Facebook is easier for me to used and update. I mentioned my husband and I have a web series. It is more of a bar comedy from a bunch of actors who just wanted to work together. Season one was shot with zero budget and season two actually got a bit of funding. We have a long way to go but do have a few projects on back burners as we try to find time for them. You can find Bar Flies on youtube for free. Fan interview posts will be released on Fridays (subject to content). See the Open Call for Fan Interviews if you'd like to participate.